Isaiah had a vital message for King Ahaz in Jerusalem. Israel, the northern kingdom, had formed an alliance against Judah with Aram—a pact that made Ahaz fearful. But God sent Isaiah to Ahaz with a message of deliverance from this threat, and invited the king to ask for a confirming sign. Ahaz’s answer (7:12) sounds pious, but the response shows it to be a statement of unbelief. The sign that Judah would be delivered from the Israel-Aram alliance was the birth of a child who would still be in infancy when Israel and Aram were laid waste. Within a few years of this prophecy, these two nations were conquered by Assyria and the threat to Judah was over. By this time, Isaiah had one son whose name was a sign to God’s people: Shear-Jashub (7:3), meaning “a remnant will return.” Then the prophet had a second son: Maher-Shalal-Hash-Baz (8:1), meaning “quick to the plunder, swift to the spoil.” This child’s name was a prophecy of the swift destruction of Aram and Israel by Assyria. In chapter 9, Isaiah described a brighter day to come with the birth of Ahaz’s son, Hezekiah, whom the Talmud and later Jewish commentators agree is the person in view here. The nation would need this hope as God’s hand of judgment fell again and again-although chapter 10 includes the promise that Assyria herself would one day be dealt with by God. This prophecy was fulfilled when Assyria fell to the Babylonians in 609 BCE. How was the child “Immanuel,” prophesied about in Isaiah 7:14 a sign that God was with His people? Why did Isaiah say in 8:13 that God was the only One His people needed to fear? 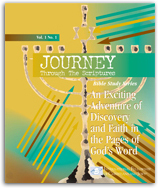 How did Hezekiah prove to be a blessing to the people of Judah (Hint: Read 2 Kings 1819)? Isaiah 9:810:4 describes the fall of Israel. List some reasons for this severe judgment. Isaiah made a remarkable statement in 8:20: “To the law and to the testimony!” This was a stirring reminder to God’s people that His Word is our only reliable standard. Let us take the prophet’s exhortation to heart in these days of continued threat and unrest for Israel and among the nations.